I seriously had THE best birthday weekend EVER! It was filled with amazing food, shopping, and sight seeing. What's better than that?! W and I had such a blast celebrating with my sweet parents. After getting off the cable car at Fisherman's Wharf we walked to Ghiradelli square where we had the most mouth watering ice cream! My mom and I split a delicious caramel sea salt sundae while my dad and W indulged in ice cream cones. Calories don't count on your birthday weekend, right? Besides the amazing chocolate and ice cream, Ghiradelli square is filled with super cute restaurants and shops! We had so much fun wandering into random boutiques. After Ghiradelli square, we popped back on the cable car (I'm now seriously obsessed) and headed to walk around Pacific Heights. Here, we stumbled across the most beautiful park with stunning views of the bay. I definitely foresee a lot of picnics and cat naps in this park! Our feet were tired after walking around all day so we stopped for a cocktail at the cutest neighborhood bar on Fillmore street called Palmers! W and I will definitely be back because their food looked as tasty as their cocktails. My actual birthday was on Monday and I was able to take the day off from work since my family was in town! I have to admit, it was SO nice not having to work on your birthday! We toured the city ALL DAY LONG in a double decker tour bus! It seriously was the best and quickest way to see all the sights! It was the most of SF I've seen yet! 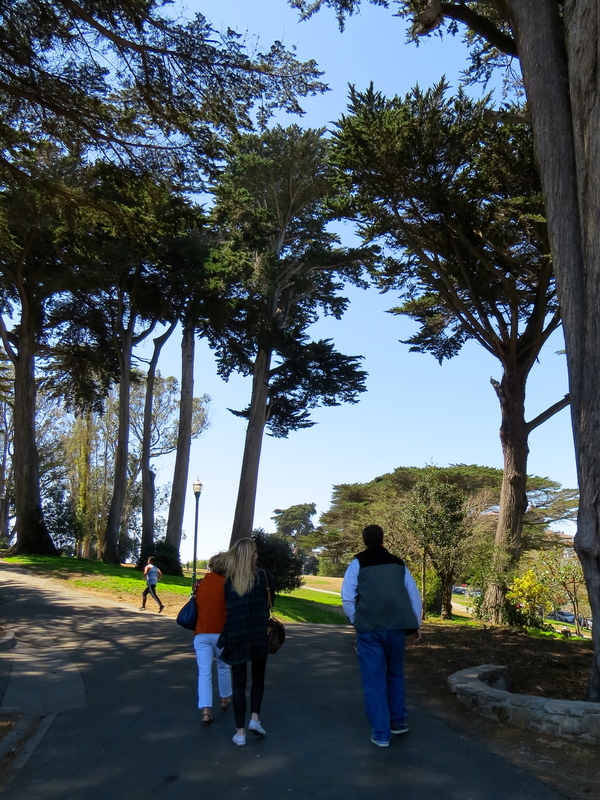 We did three different tours - downtown, beach and parks, and the golden gate. ! The only time we hopped off the bus was The Painted Ladies stop! The bus wasn't allowed to drive past them and I've been dying to see these incredibly charming houses! They did not disappoint! BUT admittedly, I had a hard time figuring out which one was the "Full House" house! Do tell me if you know!! Since it was such a beautiful day, our bus took a little detour that is normally not on their route to Lands End! They typically don't stop here since the fog usually covers the amazing view of the Golden Gate Bridge. We were so blessed with the beautiful weather over the weekend! OH MY GOODNESS it was crazy windy being on top of a double decker bus while going across the bridge! The wind was so loud we couldn't even hear what our tour guide was saying! But those views though…! Towards the end of the tour, I had to put on my Dad's vest because it was so chilly by the bay! Please excuse my hair - I just give up when it's that windy!